If you fail to meet the expectations of key influencers, projects will be delayed, will only be partially workable or at worst, doomed. Stakeholders can and will influence the outcome of your project, especially if they are likely to be directly affected by it. If we fail to meet the expectations of key influencers, projects will be delayed, will only be partially workable or at worst, doomed. Why is stakeholder management so difficult? Stakeholders have conflicting priorities and often are not working towards the same goal. Personal ambitions may trump the company vision. You may be the messenger bearing bad news or saying no to their proposals. Seasoned procurement people use their persuasive skills to win support from stakeholders. This can be the difference between success and failure. Because stakeholders will change over time, we need a systematic approach to identify and prioritize those influencers. A stakeholder map is a simple analysis tool we can use to identify which key people have to be won over. Stakeholders with a high level of influence in your specific project and who also have a high level of commitment and support must attract the most focus. They are usually easily identified and are easy to engage. They usually include line managers and end-users. Ensure you continue to maintain their support through good communication and monitoring their needs. These people can be used to influence others. This is an important group to manage and may include senior management, e.g. CEO or GM. Keep them satisfied. Increasing their interest or commitment to your project through regular updates can be very helpful. These customers are your supporters. Keep them informed, their enthusiasm may be infectious and they may have more influence in the future. Less time is needed to maintain this group. External stakeholders such as the media and government may fall into this group so it is not necessary to spend too much time there. But keep them in the loop and monitor them as they may move into another group! Identify all key stakeholders and plot them in the grid in Figure 1. 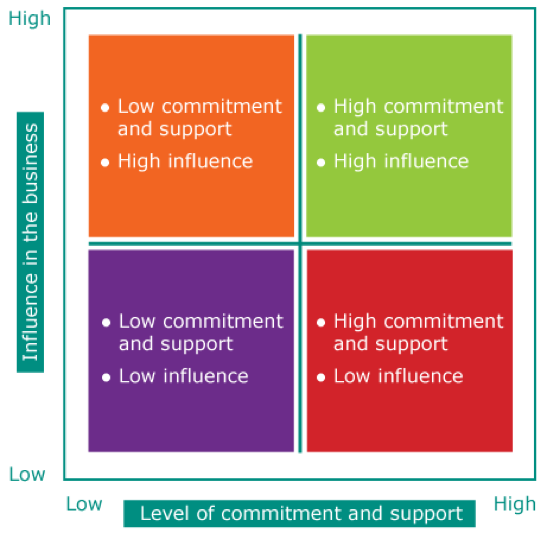 Concentrate your time on working with key stakeholders who can make or break the initiative. Make sure every stakeholder has an appropriate way to participate and offer input. Understand and manage their expectations. Identify any potential adversaries early in the process and manage them directly by allocating key tasks to them. Persuade those people who may not be immediately supportive. Under-promise and over-deliver. Think like a salesperson. Keep everyone well-informed and build strong relationships with the people who support the project. Recognise and reward positive behaviours to preserve the relationship and buy continued support. The first step is to clearly identify those stakeholders and work out what motivates them and what is causing their resistance. 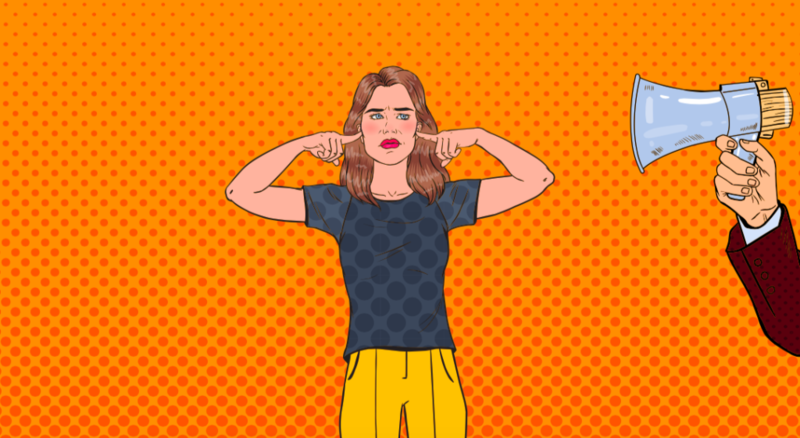 Ignoring difficult stakeholder behaviour is not recommended; take time to immediately identify the cause of their objections and the underlying issues. People want to feel understood and feel that their opinions matter. Engage directly with the person directly without others present. This leads to more clear and calm conversations. Actively listen to what they have to say and don’t close communication channels because you don’t like what you hear. Remain fair, objective, and professional, and remember to keep the project objectives within focus. Try to find common ground by asking open-ended questions. Lack of frequent and accurate communication to and from stakeholders is probably one of the main reasons for the failure of projects. Another is not listening to the needs and concerns of the key stakeholders, both internal and external. before the launch of a project to get buy-in. Early engagement is important. at regular progress meetings held to keep everyone updated. Report back on progress (or lack of it) and milestones achieved. Stakeholder management is the process that we use to identify key stakeholders and win their support. We use the analysis grid to prioritize them by influence and commitment. Understanding what motivates them is the first step to getting them on board. Cybersecurity – What Does It Mean For Procurement In 2019? Is Marketing A Procurement Blind Spot?